The first batch of the 2019 Chevrolet Corvette ZR1 has reached owners and one of them took his manual transmission LT5 car to a dyno shop to see how much power it makes at the wheels – hitting the 660 horsepower range with only around 250 miles on the car. The 2019 Chevrolet Corvette ZR1 is powered by the new supercharged LT5 engine, delivering 755 horsepower and 755 lb-ft of torque at the crankshaft. Those figures make the C7 ZR1 the most powerful Chevrolet road car and the most powerful Corvette road car ever, beating the C7 Z06 by a comfortable margin. The big power of the LT5 engine will make the new ZR1 the quickest, fastest and most track-capable Corvette ever, but today, we are focusing on the power numbers. YouTuber Street Speed 717 recently took delivery of his 2019 Chevrolet Corvette ZR1 – the 1st one delivered with the 7-speed manual transmission. After a few rainy days of ownership, he took the car to Race Proven Motorsports to make a few rips on their dyno to see how much of that horsepower and torque made it to the wheels. The owner hoped that it made around 668 horsepower at the wheels, and while he didn’t get the number exactly at first, he did guess the correct number for the second run. On the first run, the stunning orange C7 Corvette ZR1 made 664 horsepower and 637 lb-ft of torque at the rear wheels. On the second run, it made 4 more horsepower and almost 7 lb-ft of torque, rising to 668 and 644. On the third run, it hit 664 once again, this time laying out 643 lb-ft of torque. If we look at the official horsepower and torque figures of the 2019 Corvette ZR1 that are measured at the crankshaft and compare them to the wheel horsepower figures, the C7 ZR1 is losing about 11.5% of its power between the engine and the wheels. Mind you, this is a manual transmission car, so it is prone to have less drivetrain loss than a new ZR1 with the 8-speed automatic transmission, but with nearly 670 rear wheel horsepower – this car makes more power at the wheels than any General Motors vehicle before it. As an interesting note, in looking around online for stock wheel horsepower figures for the Dodge Challenger SRT Hellcat with the manual transmission, there is a smaller gap than you would expect. Dyno numbers for the three-pedal Hellcats tend to be in the area of 630-650 horsepower, so while the ZR1 has an advantage of 48 horsepower at the crankshaft, that margin is a little smaller at the wheels. For those wondering, the most powerful American road-going production car to date is the 2018 Dodge Challenger SRT Demon, which makes around 730 horsepower the rear wheels on pump gas with an engine rating of 808 horsepower. 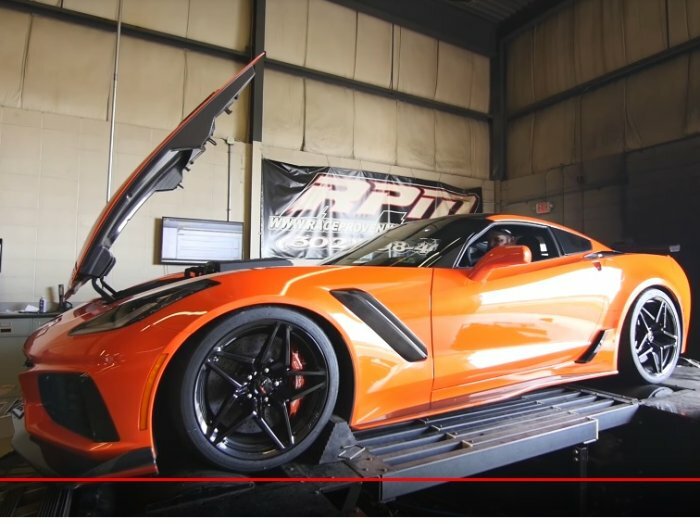 Crank up your speakers and check out the video below from Race Proven Motorsports of the first 2019 Chevrolet Corvette ZR1 to hit the dyno!